The latest rap battle pits the main protagonists of William Shakespeare's famous tragedy "Romeo and Juliet" against the criminal couple of Bonnie Parker and Clyde Barrow. This battle will features special guests Hannah Hart and Grace Helbig as Bonnie and Juliet respectively. Like the season 4 premiere, Ghostbusters vs. Mythbusters, Romeo and Juliet vs. Bonnie and Clyde has been a very popular suggestion for a very long time. 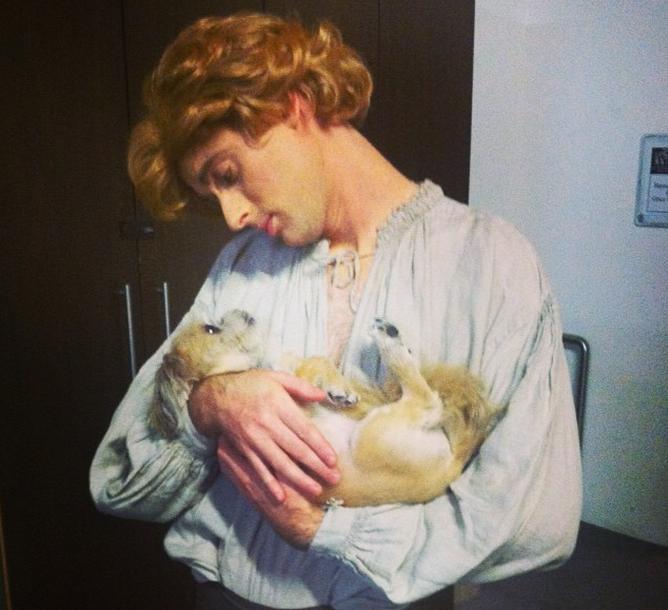 Peter and the rest of the crew had shown their support for the idea on multiple occasions, but the first suspicions that it was actually happening came about when the tags for the ERB Season 4 Preview inexplicably featured the word "mercutio", who is one of the characters in Romeo and Juliet. Remaining doubts disappeared when Peter posted this picture of himself on Instagram wearing a costume of what could only be Romeo. This match-up was slightly controversial here on the ERB Forum for various reasons, but it seems a majority enjoyed the suggestion. Now that the battle has been released, reception has been quite positive, with some calling it the funniest battle yet, and polls being very split on the winner.